Rechargeable seawater battery that uses seawater as an active electrode offers a low-cost route to large-scale energy storage, according to a new study. Our team investigated whether sodium ions could replace increasingly rare lithium ions in an alternative type of battery technology. To achieve this, we designed an ‘open cathode’ layout that continuously circulates seawater — a safe and inexpensive sodium ion source — over anodes made from high-capacity hard carbon or tin–carbon nanocomposites. By providing a near-limitless supply of sodium ions, this concept overcomes the irreversible initial alloying behavior seen in these anodes, thereby providing superior battery recharging capabilities — no change in storage capacity was detectable after 30 charge–discharge cycles. Waste - to - Lithium recycling system can recycle waste Li-ion batteries (LIBs) and can extract lithium ion, and can produce lithium metal from it. 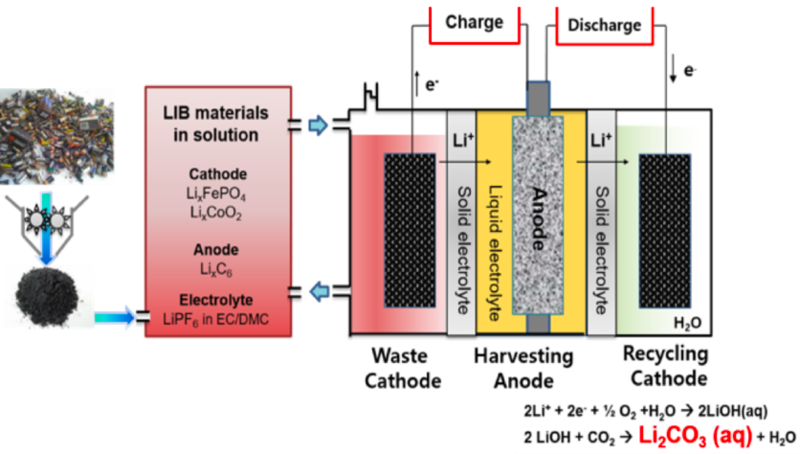 We can harvest lithium from LIB’s anode materials and liquid electrolyte. We only use water and waste battery materials in anode part, where oxidation occurs. When charged, Li ion pass through solid electrolyte and Li metal can be formed at cathode part, where reduction occurs. Multilayer electrolyte cell (MEC) was designed and developed as a new tool for investigating electrode/electrolyte interfacial reactions in a battery system. The MEC consists of two liquid electrolytes separated by a solid electrolyte which prevents electrolyte crossover while selectively transporting Li+ ions. 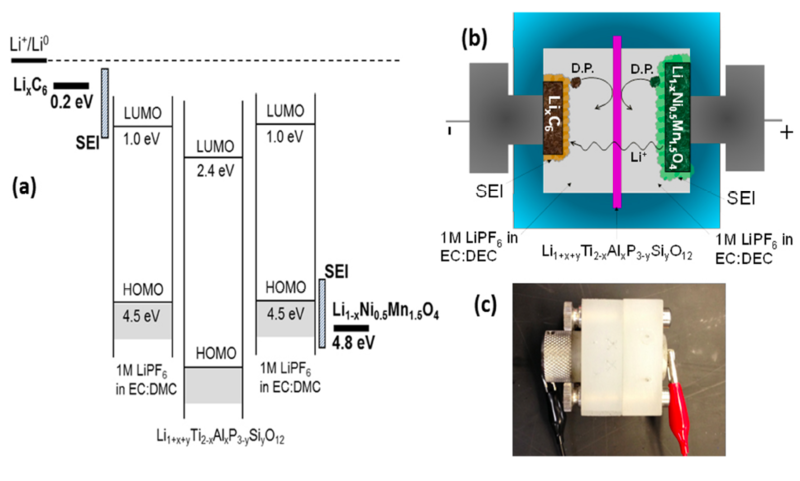 The MEC can be a strong tool for identifying the electrochemical performances of future high voltage positive electrode materials and their electrode/electrolyte interfacial reaction. During charging the seawater battery system, the desalination device can produce desalinated water. The desalination is decreasing process of ions from seawater (~35,000 ppm) to available water (< 10,000 ppm). The conventional desalination devices use heat to boil water or reverse osmosis membrane which can penetrate only water molecules. The both methods require large amount of energy consumption for desalination. However, the desalination device using seawater battery can store the energy when seawater is desalinated and recover the energy during the discharge step. Therefore, this method can overcome the high energy consumption for desalination through convergence between battery technology and desalination material such as Cl captured electrode or capacitor. This system has been proven to change the seawater (~35,000 ppm) is desalinated to Brackish water (~7000 ppm). Flexible lithium ion batteries (LIBs) hold great promise for the next generation energy sources of future electronic devices. Recently, substantial progress and advances in flexible LIBs have been achieved, particularly for flexible fabrication of battery component units and their integration technologies. However, a further breakthrough for facilitating their application to a broad variety of deformable electronic devices is being required. A liquid metal battery utilizes all liquid state components, including negative and positive electrodes and molten salt electrolyte, which self-segregate into three distinct liquid layers due to their immiscibility and difference in density. During discharge, the negative electrode, metal A is electrochemically oxidized (A → Az+ + ze-) and migrate through the electrolyte to the positive electrode, metal B, forming A-B alloy (A in B), while releasing electrons into an external circuit. The reverse reactions occur upon charging.